"Instead of proposing another theory of war, their goal is a more modest one of raising the theoretical consciousness of historians. 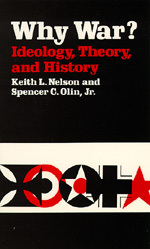 Specifically, they argue that '1) ideology does influence theory, 2) historians do have ideologies as well as theories . . . about which they are not always conscious or consistent, and 3) we can better understand, compare, and evaluate what historians are saying when we comprehend their ideological and theoretical perspectives.' They attempt then, to classify historical interpretations of war according to their ideological/ theoretical orientations, however covert." Edward A. Dickson Emeritus Professor, History School of Humanities, at the University of California, Irvine Spencer Olin is Professor of History at the University of California, Irvine.